By now we’ve all heard about video doorbells and their rise in popularity over the last few years. Video doorbells are installed at your front door so that when your doorbell rings, you can check your phone for video footage of who is at the door. There are many benefits to installing a video doorbell at your home. Read on to learn about the many benefits and how Hawkeye can help you install one in your home. Security when Home: A video doorbell serves as a caller-ID for your front door. When you are home alone, or have children home alone, it can provide a sense of security to be able to see who is at the front door before you open it. Peace of Mind when Away: When you take off for a vacation, there are many things that you do to ensure that your house will be safe and secure while you are gone. Video doorbells can provide an extra layer of security while you are away. You are able to get alerts anytime someone is at your door, and can check in to see if there have been any deliveries since have left. Package Delivery: These days, everyone is receiving package deliveries multiple times a week, if not every day. From grocery delivery to online shopping, it can be worrisome to know that a package may be delivered while you are away from your home. Deters Potential Intruders: Whether you’re home or away, your video doorbell serves as a signal to intruders that they are under surveillance. Often times, this will deter an intruder of trying to move any further with a break-in. At Hawkeye Security we work with the Skybell video doorbell system to provide security and peace of mind for our customers. Unlike other similar products on the market, the Skybell also allows the regular doorbell in the home to still operate in addition to alerting your smart-phone that someone is at your door. 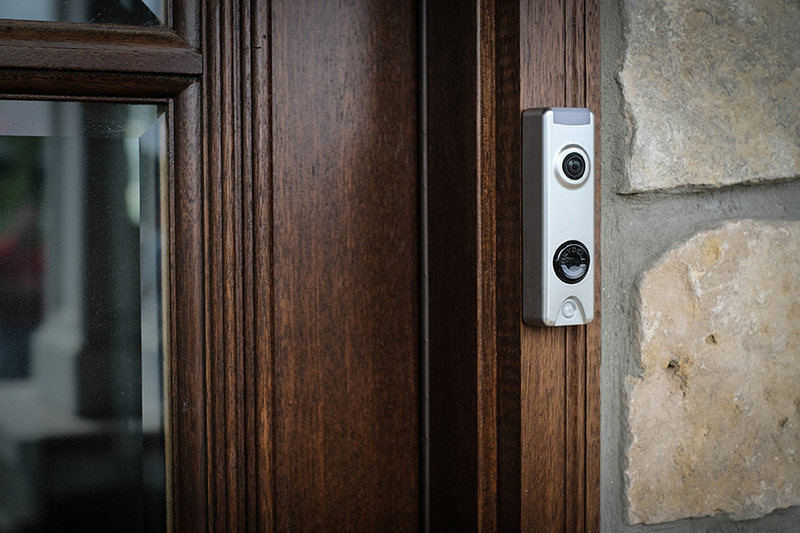 Additionally, your Skybell doorbell can integrate into the Honeywell TotalConnect app, if you already have a security system installed in your home. If you are interested in learning more about a Skybell video doorbell system, or want to schedule an appointment to have one installed, don’t hesitate to reach out to us today. Call us at (812)-284-3200 or click HERE to fill out our online contact form.